I am a conservative hippie. Chew on that for a minute. I belive in giving more to the land than we take from it. I believe in using the resources available to us rather than having to depend on imports, whether it be from another country or another state. I believe that the government should get itself the heck out of my life. I believe that I AM qualified to determine what I can/cannot and should/should not eat. I believe that my right to keep and bear arms should absolutely not be infringed. I also love to tie-dye. My niece got a tie-dye kit for Christmas, and I offered to show her how. We've had many tie dye parties out camping, and I even got my bellydance group out to dye their own veils. So, just in time for my brother and sister-in-law's anniversary, my niece and nephew get to come over and stay the night. The weather is even cooperating!! We're going to have a dye party, go hiking, and pretty much figure out what else we can get into. I simply cannot wait. My niece is an amazing person. I still can't believe that she's grown into the young lady she is now. Heck, it seems like yesterday that the most wonderful thing in her little baby world was my sparkly blue fingernails. (she kept trying to eat them.) Now she's a beautiful young woman, a talented oboe player (and that's saying something!!) and a martial artist. WOW. So tomorrow I'll have 4 kids. I can't wait to introduce them to farm life. 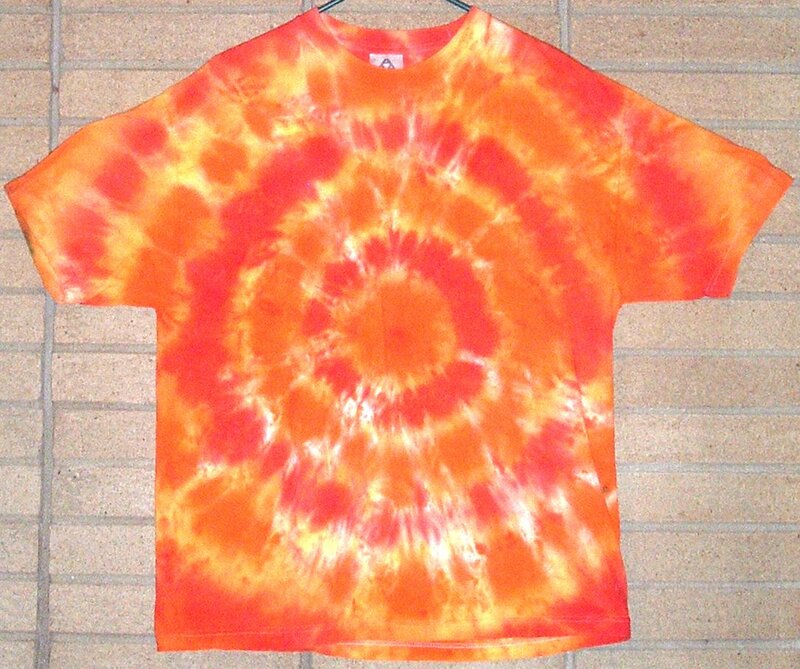 Even more, I can't wait to show them the artistry of tie-dye. You can have a basic method in mind, but it doesn't always come out like you think it will. But even those things--they're beautiful. Sometimes beauty is found in what you thought was a mistake. Bob Ross used to call them "happy accidents" and on that point, I agree. If you've never done tie-dye, come see me. You can do basic patterns and colors or try something wacky, but unwrapping each project is like unwrapping a Christmas present. Each one comes out just a little different. Just like all of us. So maybe it's not quite like you planned, but the longer you look at it, the more beauty you see. That's something to remember. Photo from Wikimedia. You'll see our projects on Saturday! I think I do understand hippie/conservative. I want the guvment out of my life too. Reading about Kathleen Sebelius' food nazis taking away the home made lunches makes my blood boil. Why don't they concentrate on the crap they serve kids in public schools? yeah, the one I read about took her homemade lunch away and served her chicken nuggets. Processed food. So how is that better?!? Ah well, at least we eat honest out here.